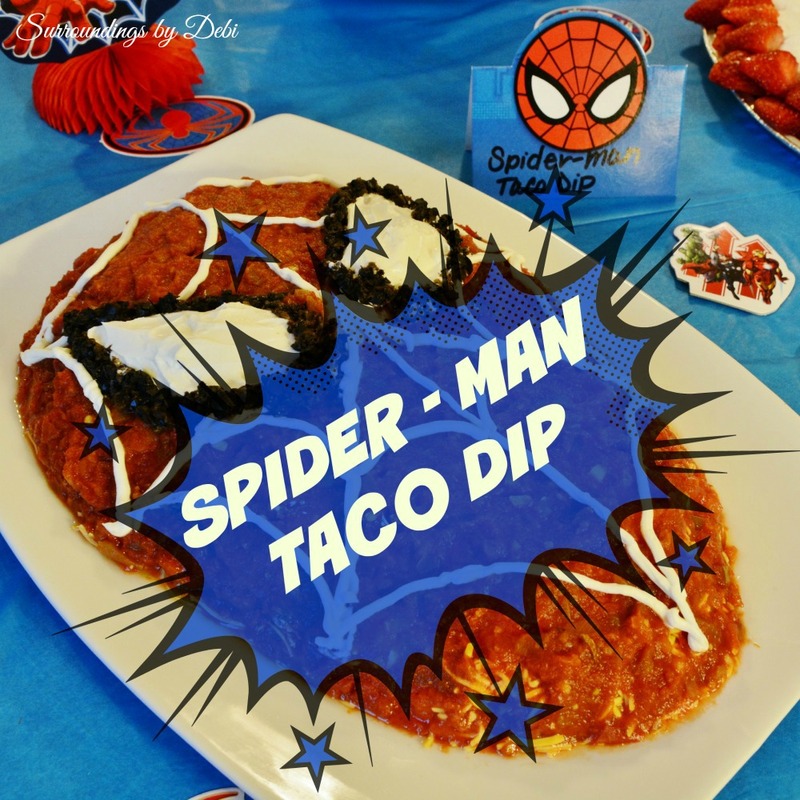 Spider-Man Taco Dip - Fit for a Super Hero! 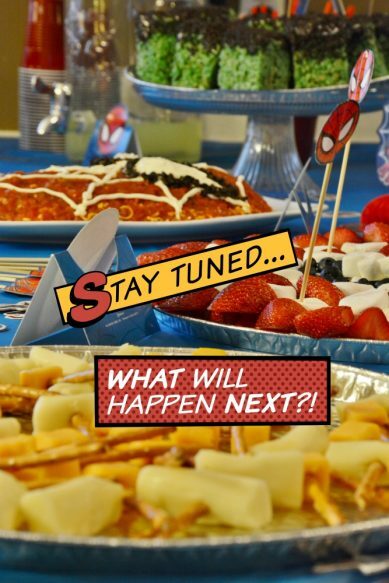 We’re having a Super Hero’s party! So of course, we need “Super Hero” food! Something Special! – Something Fun! – Something Delicious! 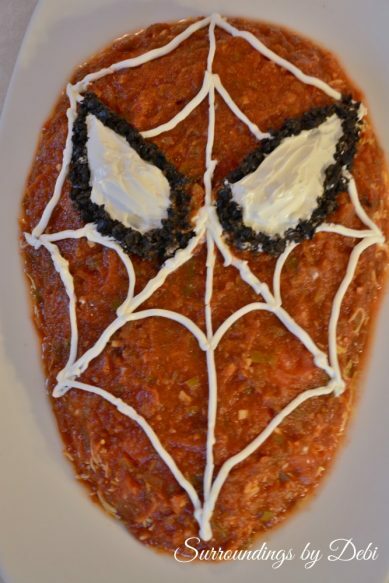 My daughter and momma to our little “Super Hero” had found lots of ideas on Pinterest for our party and one was to create Spider-Man’s face out of 7 layer taco dip! So now how do we do that? While she had a picture of what she wanted, there weren’t any step by step “how to’s”. So, we dove right in and created our own. 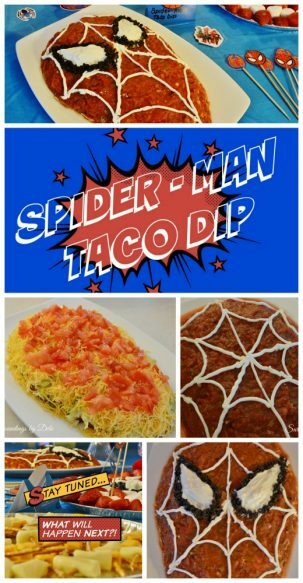 In a medium bowl, mix the taco seasoning and the refried beans and spread on the large platter shaping into the Spider-Man head as you work. 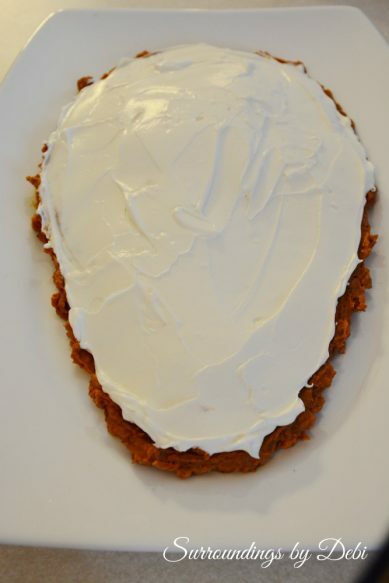 Mix the sour cream and cream cheese in a medium bowl. Set aside about ¾ cup of the mixture and spread the remaining over the refried beans. 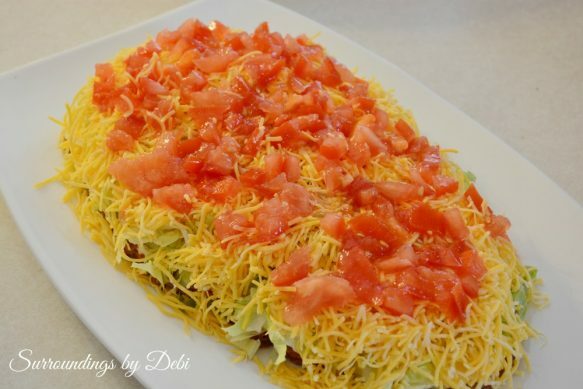 Layer the lettuce, green onions, cheese and tomatoes over the cream cheese mixture. 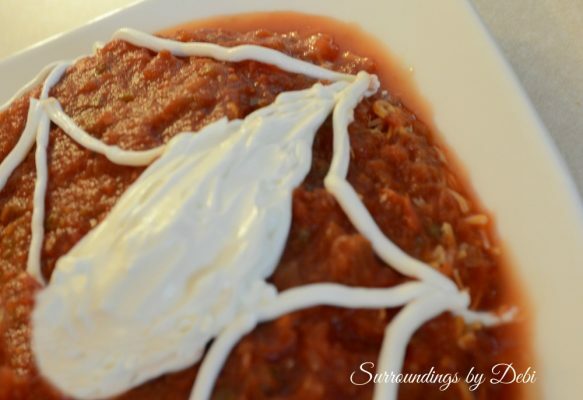 Carefully spread the drained salsa over the top of your creation. 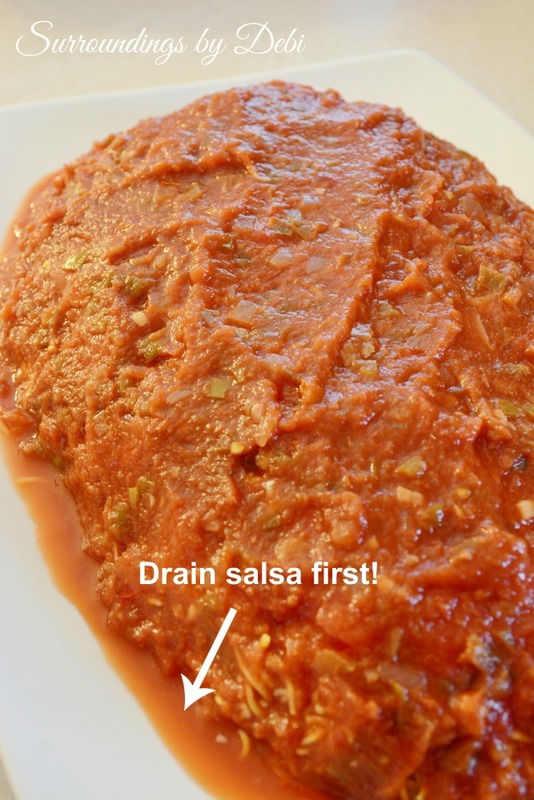 It is important to drain the salsa. We learned this as we went along. 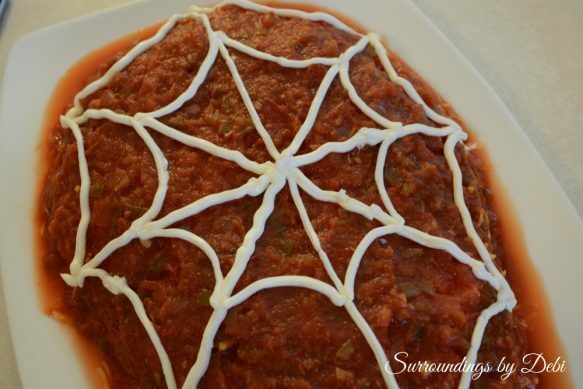 You will see here where the salsa has drained onto the plate. We were able to absorb it with paper towels but it would have been so much easier to drain it in the beginning. Add the remainder of your sour cream and cream cheese mixture to a small plastic baggie and cut a small hole in one of the bottom corners. This will serve as your “icing” bag. Carefully draw your spider web over the salsa. Add the eyes to your web creation. 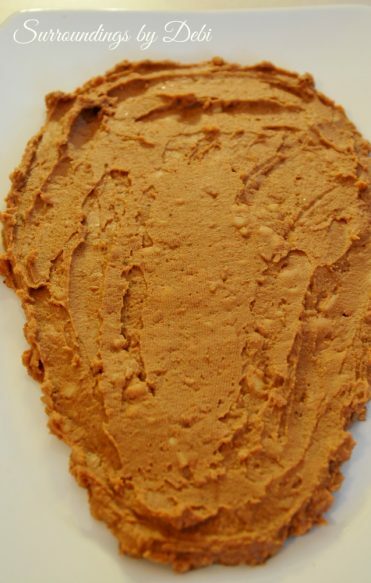 Once you have your eyes placed, outline the eyes using the drained black olives which have been cut in halves. When we got ready to use our olives, we discovered we had purchased chopped olives instead of the sliced ones! We were able to make them work – but the sliced would have been easier. All done! 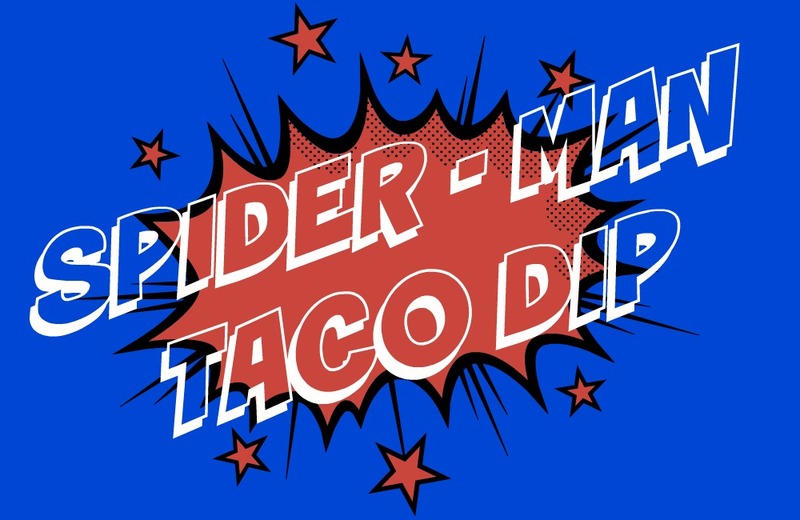 Now be sure to take a few pictures of your Spider-Man Taco Dip party creation – before your super heroes devour it! 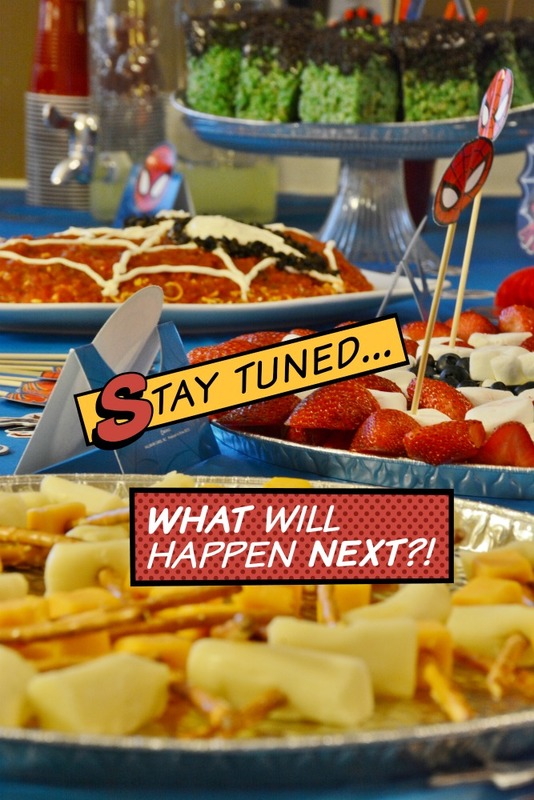 And stop by soon as we share our complete super hero party – full of even more ideas! Remember to pin this to your Pinterest party board! You can see what I am pinning HERE. Share this post on Facebook, Twitter, Pinterest, Google + or all of them, simply by clicking the icons below. To receive these posts directly to your inbox, simply subscribe at the top of the page. 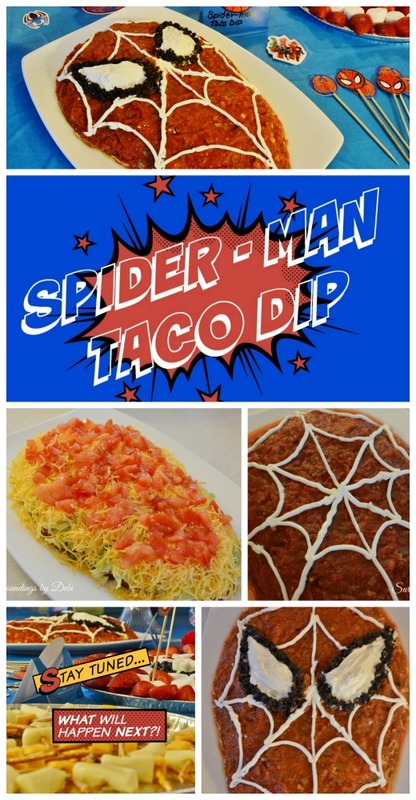 Your Spider Man Taco Dip looks awesome, so cute! 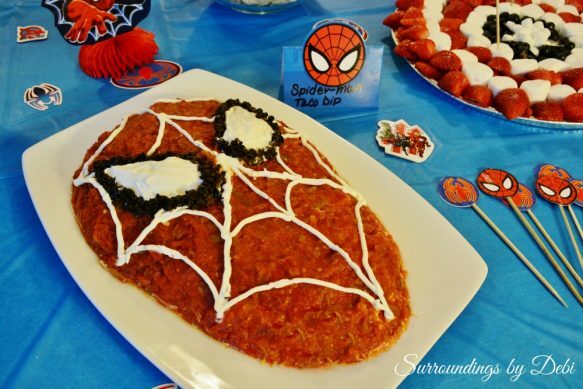 Thanks so much for sharing this dip with Full Plate Thursday, great idea! Hope you have a great weekend and come back soon! Thank you Helen. It was a fun food project! I’ll be back! Very cute! I am sure this would work for many fun kid parties. Thanks for sharing with the Thursday Blog Hop! This is too cute (and looks delicious)!! I’m pinning! We had a great time at the party Logan! Stop back by to check out the full party!